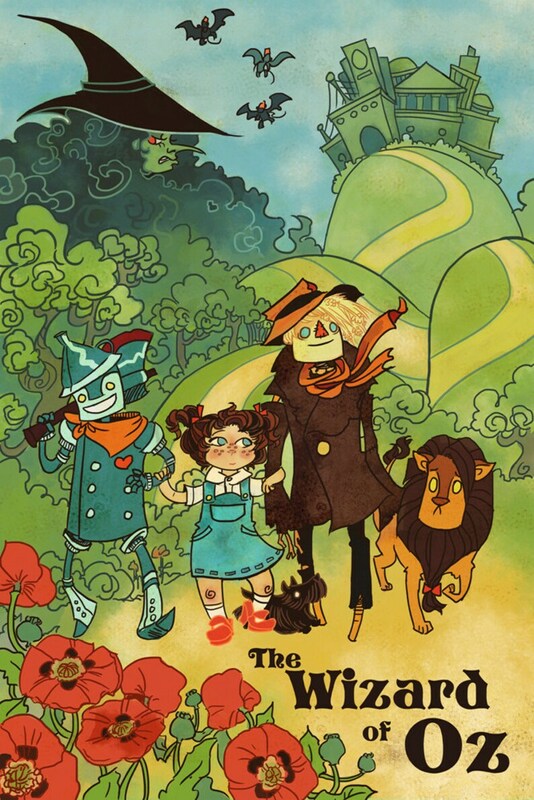 One of the first books read to me was The Wizard of Oz, and my father read it out of a copy purchased in his youth in his hometown, complete with the vintage illustrations. They have been a big influence on my work and my life in general, as I'm sure they have for so many of us! In his forward, Frank L. Baum states that he wanted to write a story with the fun of a fairy tale, but without the objectionable morals that ruined the adventure for him. He was joining the very modern trend of actual speculative fiction, as CS Lewis and JRR Tolkien pioneered. This poster on lustrous photo paper will be mailed to you in a cardboard poster tube for protection! 12x18 standard photo size and easy to frame, printed on matte lustre photo paper, archival quality with amazing color! For those paying with e-check, your item will not be shipped until payment goes through. I accept paypal and credit card through etsy. If you convo me for a size upgrade on a print, or to add an extra item, your order will be delayed until you have completed payment. I can refund you via paypal if you catch me before your item ships. In that contingency, please return the item and I'll refund your original payment. If something happens to your item in the mail, send me a photo and I'll replace it! I may ask you to pay for shipping, especially if the error happened due to a mail carrier bending the package, or if you want any kind of exchange. I ship within a week, unless custom printing takes longer than usual. My carrier of choice is USPS, and unless you ask (and pay) to be upgraded to priority, it will be first class. I cannot ever guarantee an item will ship by or be delivered by a specific date. If your country charges extra post office fees for customs, etc, I am NOT responsible for those, and will not reimburse you, so sorry! Make sure you know your local post office's rules for customs, etc, so you can avoid extra charges or any bad surprises like that. Once you've purchased the item from me and I've shipped it, I have no control over the rest of the process. I'm excited about custom orders! Drop me a line and we'll work something out!